It’s hard to believe that we won’t be getting anymore Outlander until next spring. To be exact, April 4th in the U.S. on Starz, and for those of us living in Canada, Showcase has posted on their website an ambiguous “April 2015” return date. All I can say is that I hope we don’t have to wait an extra three weeks to watch the second half of the season like we did with the first half, but I know that I’m just deluding myself to think otherwise! In this mid-season finale, I finally get an answer to the question that I asked 15 years ago, which was “But what about Frank?!”. 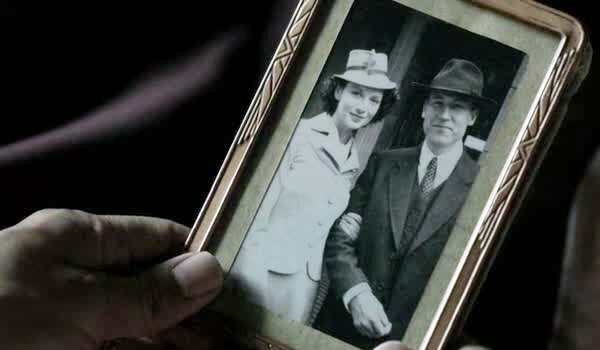 In her review of Episode Seven, “The Wedding”, Andrea discussed how her feelings about how difficult it must have been for Claire being torn between Frank, her husband back in the future and Jamie, the husband of her present circumstances. As the story progresses, we know that Jamie and Claire were meant to be together, and that the relationship that she has with him has a greater depth than the one she had with Frank. But we never really get to see what it was like for Frank after his wife disappeared. I think that was likely done intentionally so as not to detract from Claire and Jamie’s story. Although, perhaps Diana Gabaldon did have plans for Frank and that part of the manuscript ended up on the editing room floor? Regardless, I really enjoyed the show’s interpretation of what might have happened to Frank. The episode opens with Frank desperate and desolate at the police station in Inverness. 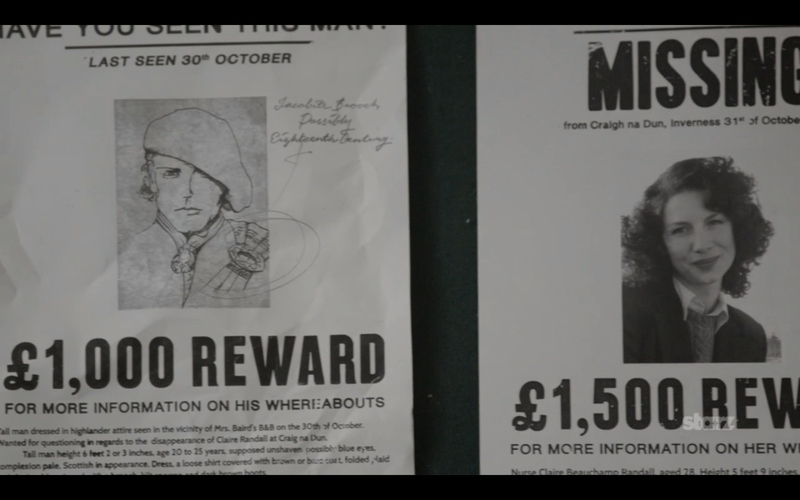 As Frank makes another attempt to get the detective to work harder to find Claire, it becomes clear that the police no longer believe that she is missing but rather that she has run off with her lover. After Frank reported that he caught a man the night before Claire disappeared gazing mournfully up at her window, the police decided that Claire and this mysterious Highlander must be lovers and that Frank needed to accept that he had been dumped. Later that night, as Frank drowns his sorrows at the local pub he is approached by a woman who supposedly has information about the “Highlander” suspect that Frank has been searching for. I have to say that if Frank fell for the ploy of “come meet me in a dark alley after midnight and don’t forget the money!” I might have had a few choice words for my television, but as it was, Frank was clearly not that overcome with grief to see the con for what it was. We get to see a little of that “Black Jack” streak when Frank comes face-to-face with his would-be attackers. As he nearly beats a man to death and roughs up the woman sent in to lure him in the first place, we see that perhaps Frank has more backbone then we think. The mild-mannered Frank, was not so mild and certainly not very well-mannered. Reverend Wakefield gives Frank a cautionary pep talk about “drinking from the poisoned cup” and that Frank should never let himself sink so low again. 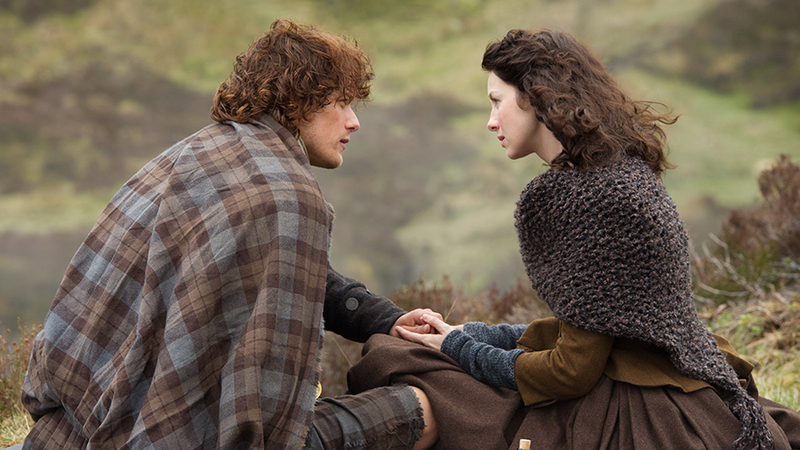 Back in the 1740’s, Claire and Jamie are enjoying the “honeymoon” period of their new marriage. All seems to be going swimmingly well, until the happy couple are set up some red coat deserters as they are in the middle of an intimate moment in a meadow where they were suppose to be searching for medicinal herbs. Claire is forced to save herself from being raped and from Jamie having to watch at gun point by using her newly acquired self-defense skills with a dagger. In the aftermath of the incident, it is clear that the honeymoon was over, as Jamie and Claire struggle with their feelings about what happened. 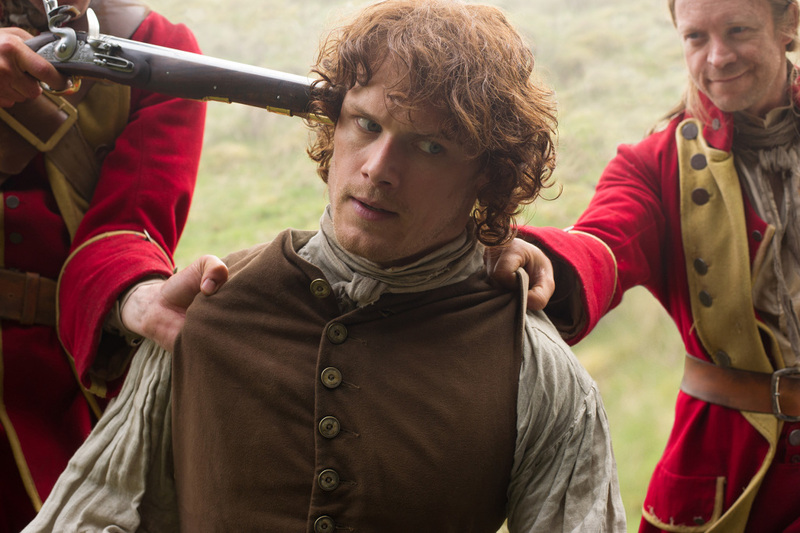 Jamie feels impotent and Claire is angry at him for letting them get into that situation in the first place. This incident is key to the next poor decision that Claire makes…and for those of you haven’t read the book yet, trust me, Claire makes many more bone-headed moves in her lifetime! She is unceremoniously left behind as the men ride off to try to get some witness testimony that might help clear Jamie’s name. It is at this point that the book and show take very different paths to get to the same point. In the book, Claire willingly makes the decision to walk away and try to find Craigh na Dun but in the show it appears to be less of a choice and more of a coincidence that she finds herself back where she started. The split screen technique of Claire and Frank both heading towards the stones that could reunite them, was very well done. The cinematography and music to the calling to each other through time was exquisite, then to have Claire come within reach of returning to Frank only to be taken by some red coat soldiers was simply the icing on the cake. 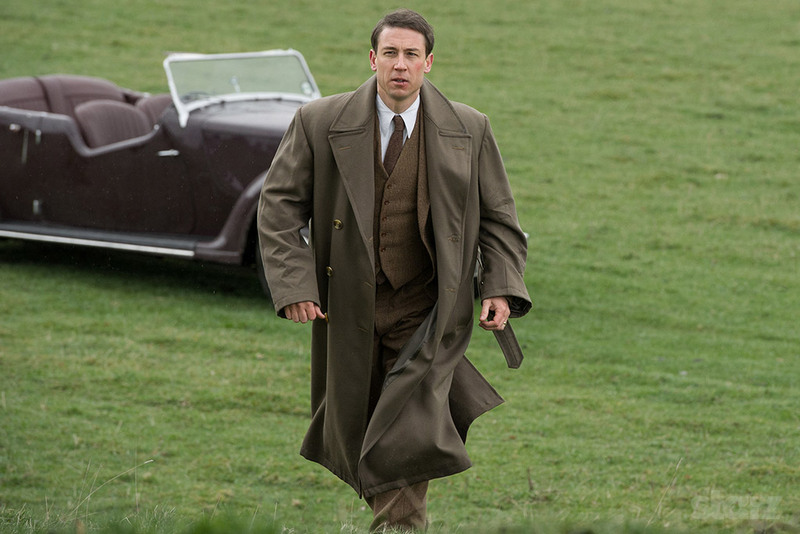 We see Frank leaving, dejected and heartbroken, while Claire is hauled off to her inevitable meeting with Captain Jack Randall. The details of Claire’s confrontation with Randall vary slightly from the book, but the essential parts are there. Claire tries to bluff her way out of an interrogation by Randall, which as usual fails miserably. We are left with Jamie bursting through a window demanding that Randall “take his hands off” his wife just as he was about to torture Claire. This is where we leave our not-so-happy couple until next April. Sigh. After many conversations with friends who have read the book, there was much speculation about where the story might leave off for this mid-season finale, I have to say that I thought we might have made it farther through the story, and now I don’t see how book one of the series can be completed in only 16 episodes which means we will likely see this book stretch into Season Two. There’s certainly enough story to go around, so now the question is just how far will they get in the next 8 episodes? The good thing about having the season split in two is that it gives us time to savour the episodes. You may also want to check out the free pod-casts on iTunes to hear Ronald D. Moore’s commentary of each episode. I have listened to the first episode podcast and found it very interesting to hear Moore’s reflections as the episode unfolded.